This page includes The Club News columns from the 1994 issues of Across the Fence Post. Fourteen-year-old Alexis Gill, of BSC's youth group, was a winner in the KIDPEX '93 Design-A-Stamp contest. Contest designs focused on the Youth Classics issue theme. As part of Alexis' prize, the 96-page, hardcover book "THE BEGINNER'S GUIDE TO STAMP COLLECTING," by Neill Granger, was donated to the Middleton Public Library, where BSC regularly meets. The Wisconsin Chapter, JPA and the WFSC sponsored KIDPEX ‘93. Milwaukee-area clubs held their eighth annual Distinguished Philatelist Appreciation Dinner on February 6, 1994, at The Grand Milwaukee Hotel. Mary Ellen Daniel was this year's honoree, and she joins a select group of distinguished philatelists from the Milwaukee area. Criteria for the honor is that the individual must have visibly and repeatedly demonstrated an interest in stamp collecting and the development of interest and enjoyment of the hobby among others. Hosting of the annual dinner rotates among Milwaukee-area clubs. This year's event was hosted by the General Billy Mitchell Chapter, American Air Mail Society, with Fay Heller serving as chairman of the Advisory Committee. Three Milwaukee-area clubs, Italian American Stamp Club, North Shore Philatelic Society, and the Polish American Stamp Club, have banded together to sponsor TRI-PEX, an annual bourse. The 1994 event will be held June 25-26, at St. Aloysius Gonzaga Hall, 1435 So. 92nd St., West Allis, WI. For further information and/or a bourse application, write to: Tri-Pex Stamp Fair 1994, qo Douglas Galaszewski, 9906 W. Grantosa Dr., Wauwatosa, WI 53222-1411. WaUSApex '94 will be held September 24-25, at the Wausau Inn & Convention Center, Hwy. 51 & Cty. NN, Wausau, WI. The show will include a bourse and exhibits, a U.S. Postal Service substation, show cachet and youth table. For further information, contact: WVPS, P.O. Box 71, Wausau, WI 54402-0071. 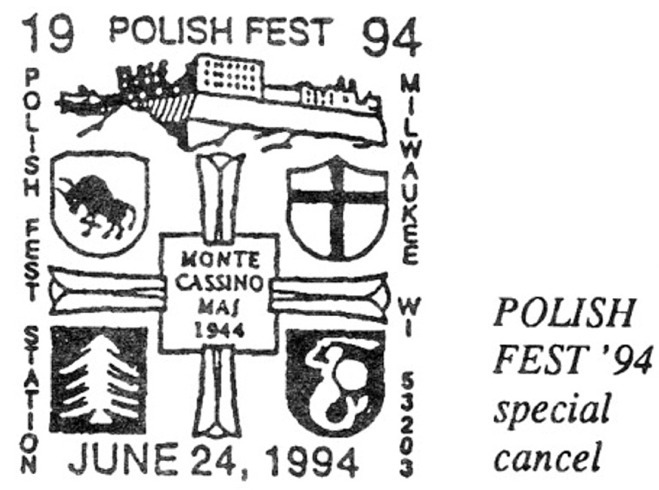 The 50th anniversary of the World War II battle of Monte Casino is the subject of a set of three souvenir postal cards issued by the Polish American Stamp Club to complement Milwaukee’s 1994 POLISH FEST. The event was held at the Henry W. Maier Festival Park, June 24-26. The POLISH FEST card designs feature Monte Casino postal stamp designs issued by the World War II Polish government in exile, the Polish Second Corps in Italy, and the postwar Polish government. All are printed on the 19 ¢ U.S. Flag postal card. The Friday card design is printed in gold and black, the Saturday card in green and black, and the Sunday card in red and black. of POLISH FEST. The cancel depicts military patches of four of the Polish divisions that participated in the Monte Casino assault. See "Cover Listing" on p. 10 for mail order information. The Polish American Stamp Club is an organization of 50 area stamp collectors and celebrates its 18th anniversary in 1994. It meets monthly at 7:00 p.m. at Calvary United Methodist Church, So. 107th St. and W. Oklahoma Ave. Visitors are welcome to attend the meetings. The Wauwatosa Philatelic Society held their annual stamp auction on Saturday, April 23, at the Wauwatosa Civic Center. Approximately 50 participants were present to bid on the 223 auction lots. The total sale was over $1500. Plans are underway for the next auction, scheduled for March 1995. 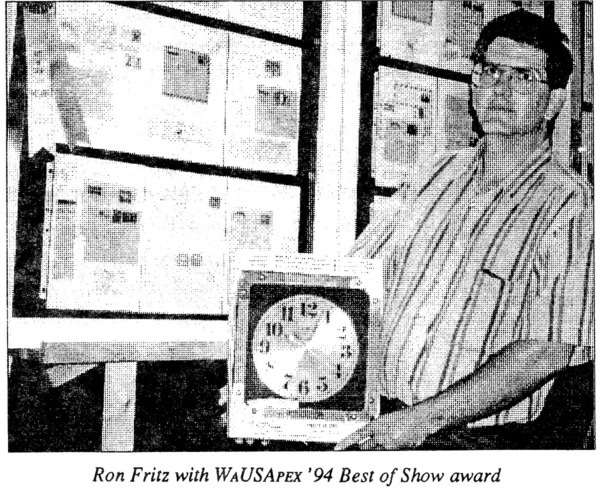 WaUSApex '94 welcomes exhibits from members of all WFSC clubs. The show, sponsored by the Wisconsin Valley Philatelic Society, will be held September 24-25, at the Wausau Inn & Conference Center, Wausau, WI. The entire exhibit portion of the show will be devoted to one-frame/16-page exhibits (youth may enter nine pages). The WVPS decided on a 16-page exhibit show for '94 as a "tune-up" for WISCOPEX '95, which will offer a single-frame category. Exhibits related to WaUSApex '94's theme, "Railroading in Wisconsin," are especially welcomed. If you haven't seen the prospectus and entry form mailed to all WFSC clubs in mid-July, you probably still have time to request those papers. This local show wants your entries! The show cover cachet will feature the early locomotives of Wisconsin railroads, as well as recognition of the Wisconsin Central, the surviving Wisconsin railroad. Covers will be franked with one of the five new Locomotives booklet stamps. The special cancel features the semaphore that stood in front of most railroad depots of yesteryear. See "Cover Listing" on p. 10 for mail order information. For further information about the show, an exhibit prospectus, guidelines for preparing a single-frame exhibit, judging criteria, and an entry form, write to: WVPS, P.O. Box 71, Wausau, W I 54402-0071. On October 5, the NSPSM will sponsor a stamp auction at Whitefish Bay School, 5205 N. Lydell Ave., White-fish Bay, WI. The auction will start at 7:00 p.m. and will feature over 100 lots of fine stamps and covers. • The WFSC will present its first annual dealer recognition award. Watch for future notices regarding the prospectus and exhibit entry form and auction rules, which will be available in mid-November. Or, get your name on the list to automatically receive these documents as soon as possible. Write to: WISCOPEX '95, 4184 Rose Ct., Middleton, WI 53562-4339. The TOSAPEX '94 show cover focuses on the new Crane stamps issue. The cachet features two cranes and bamboo stalks. Covers are franked with the se-tenant pair. A special show cancel depicts a flying eagle on the left and a crane on the right, with text in the center reading: "China - USA Joint Issue - Common Effort, TOSAPEX Station, Milwaukee WI 53214, October 29, 1994." An October 30, 1994, cancel date also is available. The show additionally will offer Crane stamp first-day covers. See p. 10 for ordering instructions. TOSAPEX '94 is the 29th annual exhibition of the Wauwatosa Philatelic Society. It will be held October 29-30 at Gonzaga Hall, 1435 So. 92nd St., West Allis, WI. Show hours for the event are 10 a.m. to 5 p.m. each day. Bill Grosnick also provided a display of railroad materials to complement the show's theme.